Welcome to our school library! I am happy to help you in any way that I can. Please feel free to email me with questions or feedback. Have a little time each week to spare? Looking for a way to help out in our school? Love books? Then have we got an opportunity for you! 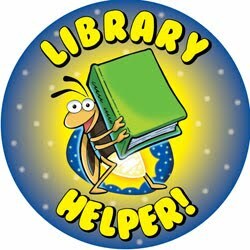 We are in need of volunteers to help in the library, particularly on Tuesday and Thursday afternoons, to help students check out books as well as to help reshelve books that are returned. Please email me if you are interested in helping out in this way. Thank you! If your child has an overdue library book, please look for a green slip to come home in his/her Friday Folder. Students will receive these 'overdue' book slips weekly. Please look for the book (in the classroom, at home, under the bed, car, etc. ), and return it to the library as soon as possible. If you are unable to locate the book, we ask that you replace the book. Please email me about this matter, and I'll be happy to help you with the replacement cost of the book. Thank you for your cooperation! Check out the following website to find out more about the Dewey Decimal System.